3-D printers can create all kinds of things, from eyeglasses to implantable medical devices, straight from a computer model and without the need for molds. But for making spacecraft, engineers sometimes need custom parts that traditional manufacturing techniques and standard 3-D printers can’t create, because they need to have the properties of multiple metals. 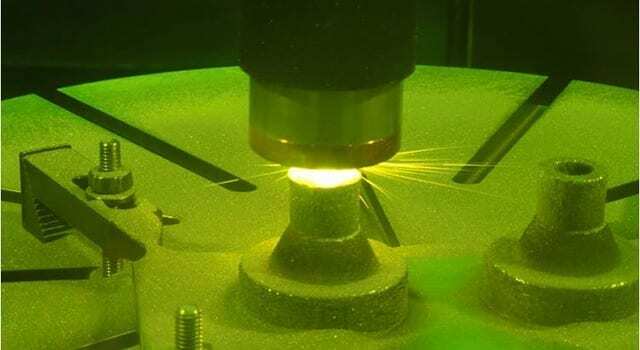 Now, researchers at NASA’s Jet Propulsion Laboratory in Pasadena, California, are implementing a printing process that transitions from one metal or alloy to another in a single object. Why would you need to make a machine part like this? Say you want a metal object where you would like the ends to have different properties. One side could have a high melting temperature and the other a low density, or one side could be magnetic and the other not. Of course, you could separately make both halves of the object from their respective metals and then weld them together. But the weld itself may be brittle, so that your new object might fall apart under stress. That’s not a good idea if you are constructing an interplanetary spacecraft, for example, which cannot be fixed once it is deployed. JPL scientists have been developing a technique to address this problem since 2010. An effort to improve the methods of combining parts made of different materials in NASA’s Mars Science Laboratory mission, which safely landed the Curiosity rover on the Red Planet in 2012, inspired a project to 3-D print components with multiple alloy compositions. Researchers from JPL, the California Institute of Technology, Pasadena, and Pennsylvania State University, University Park, joined forces to tackle the issue. The result has implications for space travel and machinery on our own planet. April 10, 2019 - Heraeus presents the world's largest additive manufactured amorphous-metal component 3D Printing IndustryHeraeus, a German technology group specializing in precious metals, has produced the “largest amorphous metal component” using additive manufacturing. March 28, 2019 - Sharebot Announces Entry-Level Metal 3D Printer ENGINEERING.comThe metalONE 3D printer is a small, comparatively low-cost selective laser melting 3D printer.